It's Thankful Thursday and Lynn of Spiritually Unequal Marriage is hosting us for the month of January. I'm thankful for rain. We get so little rain in Phoenix. So it's a major event when it happens. This week has been filled with rain and more is on the way. I love it! I'm also thankful for the rainbow after the rain. It reminds me that God's promises are true and that ...He is faithful. I've journaled for years and have so many notebooks filled with my words. But I'm thankful for blogging because it becomes a ...two way conversation. And that gives me one more reason to be thankful today. I'm thankful for ...my blogging friends. I'm amazed at how the Lord has used so many of you to impact my life. I would never have imagined that I could love people I never met in person and to actually feel their love in return. Your love blesses my heart! 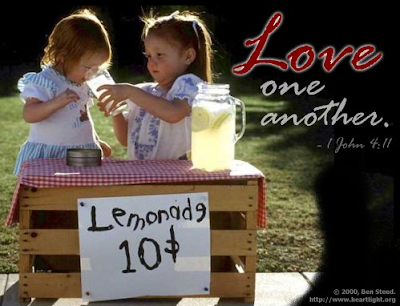 1 John 4:11 tells us to love one another. And I'm so thankful ...for that love. What a beautiful "rain" picture!! Thanks for sharing. Blessings to you Debbie, I couldn't have said it better myself-to know I have so many dear sisters in Christ who I've never met but who I'm so close to is mind boggling. You are a blessing and I cherish your friendship. PS-love the photos. I always enojoy my visit to your blog. You are a good inspiration. I am glad that we met. I'm so enjoying the DVD prize from your giveaway last month. My daughter has been in the kitchen with me lately and so we get to enjoy it together. What a beautiful post! I am truly thankful for my blogging friends also. Your pictures are beautiful and the scripture you have shared is perfect. Beautiful pictures! I also love the rainbow after the rain...God is faithful on ALL of His promises! What a wonderful post, Debbie! And I love the pictures. God is so faithful. The bloggy friends that I have made, including you, are simply amazing. I can feel the care and warmth of their voices as they write commments and posts. Enjoy the rain...it's pouring here, so it's a hat day!! And you impact our hearts, too! Yes, blogging is a two-way conversation that I wouldn't have imagined. I thank God that you're a part of that conversation with so many of us. Beautiful pictures! We have had lots and lots of rain lately, but I'm not complaining. After several years of drought, it's a welcome relief for us! You said it perfectly. It has added something so special to my life too, to 'fellowship' with other like-minded women, and you are one of them! My visits 'to and from' Debbie are always special! What a great thankful list! I am so thankful for all my bloggy friends to! And wow - what beautiful rainbows! What a great post! Beautiful Pictures and thoughts. I have had the pleasure of meeting some of my blogging friends face to face. It was a great experience. I'm so glad you blog. Otherwise I might have never met you! My daughter lives in the LA area so they've been having a lot of rain too. I am completely inspired by your posts. In your words, I see your heart... Girl, it is good. A very good heart and the Lord is so very well pleased.